The Sign You Want! The Agent You Need! Nova Scotia's 580-kilometre-long peninsula is surrounded by four bodies of water - the Atlantic Ocean, the Bay of Fundy, the Northumberland Strait and the Gulf of St. Lawrence. Its geographic location, together with large, ice-free, deep-water harbours, has been a key factor in the province's economic development. Nova Scotia is a mosaic of rugged headlands, tranquil harbours and ocean beaches. Its indented shoreline stretches 10 424 kilometres, while inland is a myriad of lakes and streams. The land is framed by the rocky Atlantic Uplands, the Cape Breton Highlands and the wooded Cobequid Hills. 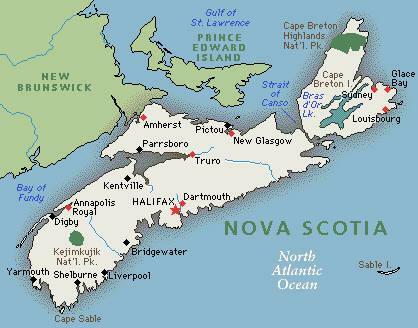 The agricultural areas of Nova Scotia are predominantly lowlands. When the glacial ice withdrew from coastal Nova Scotia 15 000 to 18 000 years ago, the ocean flooded ancient river valleys and carved out hundreds of small protected harbours which later became fishing ports. Nearly one-quarter of Nova Scotia's population of approximately 941 000 report the British Isles as their place of ethnic origin. Significant portions of the population also report either French or European origins. Many residents of Nova Scotia are of German, Dutch, Polish, Italian, Jewish and Lebanese descent. After the War of 1812, several thousand Black people, including the Chesapeake Blacks, settled in the Halifax area; in 1996, more than 18 000 residents of the province reported having Black origins. More recent immigrants to Nova Scotia have included Chinese, Indo-Chinese, African, Asian and eastern European groups. Nova Scotia's economy is highly diversified, having evolved from resource-based employment to include many types of manufactured goods as well as business and personal services. Tourism is an important sector in the provincial economy. Total tourism receipts exceed $1 billion and over 30 000 people are employed in the many aspects of the industry. More than two million people visit the province each year, with almost one quarter of these coming from outside Canada.